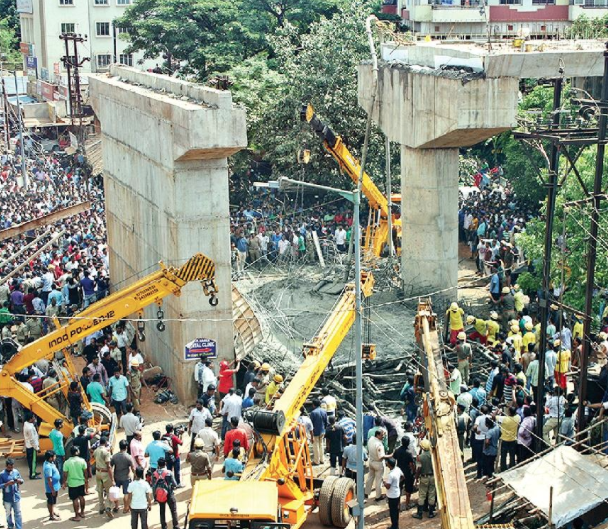 This is the collapsed flyover bridge at Bamikhal, Bhubaneswar that gives a real testimony to how efficiently Sri Naveen Patnaik administers Orissa, which the remote-controlled media house that projected him as the best administering CM of India should juxtapose with its report. Naveen babu is the minister of works and the collapsed bridge is under construction by the works department through its preferred contractor. He rushed to the Capital Hospital to see the victims and wanted to say something at the sometime. A friend has sent me a video clip that he captured from the screen of Prameya News7, which bears the picture of the CM uttering a few words in the Capital Hospital. I have put it in youtube for ready reference. It shows that the CM reads out from a piece of paper what somebody else wants him to say! This is more menacing than the mishap. Every year 2-3 bridges fall. Whatever injuries or deaths occur, it becomes celebration for PWD. In 2015 flyover on Puri road fell within 15 minutes of inauguration by CM. Against original estimate of Rs 42 crores, Rs 142 crore was again allotted in 2016. It has been built without any foundation. This time when it falls, Rs 350 crores will be allocated. Their will be bigger celebration. So far no enquiry or action has been initiated. similar to Bamikhal mishap,Gurupriya setu mishap also has taken place in Malkangiri district.And the bridge was constructed by a Kolkata based company.But no action was initiated against that particular company. Bamikhal situated in the heart of capital city therefore lots of media attention but what about Gurupriya setu?There are many flyovers,roads were constructed in Odisha which are technically sub standard what about those constructions? What else ? – Do you expect from a CM when he is the BOSS of the Dept. that supervises the OB under construction which has coolly given in ! What else ? – Do you expect from the POOR contractor who has a BankBalance of ~ 18.45 Crs BUT has work at hand worth ~ 500 Crs to be Delivered / worked-out / MANAGE THE SHOW UNDER THE NOSE OF THE SECRETARIAT. He has also to mind about the NEXT ELECTION TOO in a Yr. Or 2. Unfortunate Though ! !! !!! !!!! !!!! !